The TCM 100 drying line for short-cut pasta offers the most advanced technology available today on the short goods processing market. It is the company’s most compact solution with a technology that guarantees maximum operational flexibility. The single-body dryer integrates the predrying, drying and stabilization phases. The constructive and technological characteristics of this line allow to obtain ideal drying diagrams for each and every raw material used. The drying time of 100 minutes is reached through the implementation of a patented technology, specially designed and fine-tuned by Fava over the last number of years. This technology enables you to obtain a top quality finished product without stressing the pasta during the pre-drying and drying processes, which are very similar to the technological cycle typical of the well-known TCM E.CO.SYSTEM model produced by us and highly appreciated throughout the world. Generally the colour of the pasta is brighter with equivalent cooking quality, mechanically more resistant and more suitable for packaging since it generates a lower quantity of fragments in the packet. The TCM 100 dryer is combined with a press, which has a dough mixing system that can be one of the following: Total Vacuum, Stabilization Belt or Traditional Mixer, a 3-tier shaker predryer and a single-tier belt cooler. The 3-tier shaker exploits an oscillation system that ensures that the product is shook continually, to avoid it from sticking, and that there is an efficient air flow. The shaker is equipped with multiple coils which create optimal temperatures to prepare the pasta for the next drying phase. The sides of the vibratory trays are sealed with special teflon diaphragms to keep small-sized shapes in position despite high pressure ventilation. The TCM 100 dryer, totally designed with 3D CAD systems, was conceived with modular and functional construction criteria. It has two technological sections: an upper one and a lower one. 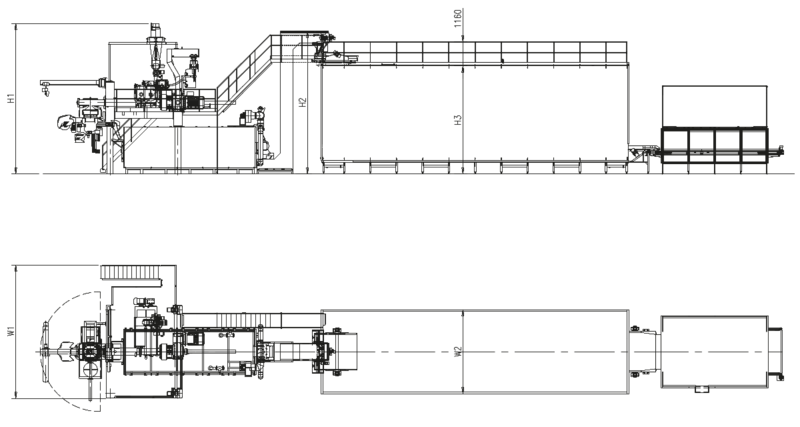 In the upper part of the dryer, its powerful vertical coil ventilation together with a patented slotted metallic belt system allow to obtain an effective and uniform processing of the pasta by guaranteeing optimal temperature and humidity conditions foreseen by the technological drying diagram. In the lower part of the dryer, a horizontal coil ventilation system is applied to the stabilization phase to ensure a perfectly stable product which is adequately prepared for the next cooling phase. The final cooling phase is done in a single-tier belt cooler. The air, cooled either naturally or by cold water coils, flows through the product according to a maximum efficiency principle, ensuring a balanced and efficient cooling of the pasta that is subsequently conveyed to the storage section in optimal condition, ready for packaging. The innovative electronic supervision system is intuitive and easy to use and ensures that you can run the line and all the production cycle phases in a flexible and reliable manner. It integrates perfectly with the pasta factory control system to guarantee the exchange of all process data necessary for production control and product traceability.